You will be counting the days until your next camping trip with this triple slide out LaCrosse. Just imagine your outdoor kitchen cook center will be the talk of the campground when you are grilling steaks for your family. You can prepare the meal inside on the kitchen island with a farm sink and plenty of solid surface counter space after grabbing the seasoning from the oversized pantry. 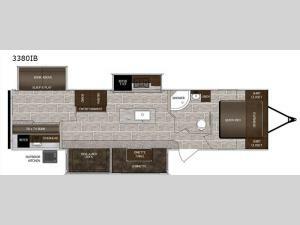 You will appreciate the two slides in the main living and kitchen area that provide everyone plenty of floor space to walk around the trailer to get to each room. If inside time is next, the hide-a-bed sofa and U-shape dinette allow everyone to come together to watch the 50" TV or play games. At night, you can retire to your own master bedroom while the kids choose a bunk bed or the Sleep and Play to try to fall asleep in their own private bunkhouse. Stop counting and head out!